The Personal Injury Group Attorneys of Morris James LLP frequently see potential clients who were involved in automobile accidents all too frequently involving minor children. Far too often it becomes evident to us that the children may not have been secured properly in their child safety seats. 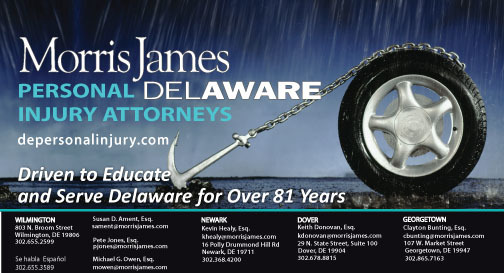 With the end of the school year and vacation season approaching, the Morris James Personal Injury Group Attorneys dedicate this article to educating Delaware residents as to the current Child Restraint Law. Delaware’s child restraint law [21 Del.C. § 4803] reads –All children must be properly restrained in a federally approved child safety seat appropriate for the child’s age, weight and height up to 8 years of age or 65 lbs whichever comes first. Additionally, children 8 through 15 years old are required to be properly secured in a seatbelt. Children under 12 years old or 65 inches in height are still required to sit in the back seat of a vehicle if there are active airbags in the front passenger seating position. The fine for violating the law is $25.00. How do you choose the correct car seat? Your infant under the age of 1 should always ride in a rear-facing car seat. There are different types of rear-facing infant seats that can only be used in the rear-facing position. Three-in-one and convertible car seats usually have higher height and weight limits for the rear-facing position, which allow you to keep your infant rear-facing for a longer period of time. Securing children in the rear-facing position for as long as possible is the best way to keep them safe while riding in a vehicle. Children should remain in a rear-facing seat until they reach the top height or weight limit suggested by the manufacturer of the seat. Once children outgrow rear-facing seats, they’re ready to travel in forward facing car seats with harnesses. Keep children in a forward-facing carseat with a harness until they reach the top height or weight limit suggested by the manufacturer of the seat. Once children outgrow the forward facing car seat, they’re ready for a booster seat, but must still be seated in the back of the vehicle. Keep children in a booster seat until they are big enough to fit in a seat belt properly. Statistically, children are 5 times safer riding rear facing than forward facing. Do not rush to transition your children to the next step. Four out of five child safety seats in Delaware are not installed correctly. For your convenience, following is a list of Fitting Stations located throughout Delaware. OHS Fitting Station – At Wilmington DMV, Rt. 13 South in New Castle. For hours and to schedule an appointment call (302) 434-3234. Christiana Care’s SAFE KIDS Fitting Station – At the entrance to the Women’s Health Care Building at Christiana Hospital on Ogletown-Stanton Rd. in Newark, For hours and to schedule an appointment call (302) 733-2472. A.I. DuPont Fitting Station – At A.I. DuPont Hospital for children, Rockland Center One – across from the Hospital in Wilmington. For hours and to schedule an appointment call (302) 651-5437. Car Seat Certified Of Delaware – At Buckley’s Auto Care, 1604 E. Newport Pike, Wilmington. For hours and to schedule an appointment call (302) 999-8285 or email buckleysautocare@gmail.com. OHS Fitting Station – At Dover DMV, Rt. 113 South in Dover. For hours and to schedule an appointment call (302) 744-2749. Delaware State Police Troop 7 – At Rt. 1 S/B Lewes, DE. For hours and to schedule an appointment call (302) 853-1014. OHS Fitting Station – U of DE Cooperative Extension office. For hours and to schedule an appointment call (302) 856-7303. When a child is injured in a motor vehicle accident due to another person’s negligence, any settlement the child receives requires Court approval in Delaware. When a Morris James Personal Injury Attorney negotiates a fair settlement for a minor, that attorney will accompany the Guardian and the minor to the Court hearing seeking approval of the minor’s settlement. The approval of a minor’s settlement is governed by Superior Court Civil Rule 133. Rule 133 (c) provides that the petition must be accompanied by medical reports or other evidence so that the court can make a determination of the reasonableness and fairness of the settlement. The court can require (and often does) oral testimony and typically will require the proposed guardian to be sworn in. The court will inquire to make sure that the guardian understands the settlement and that it is in the best interest of the minor. If the Court approves the settlement, the proceeds are required to be deposited in a special guardianship bank account until the minor reaches 18 year of age. If you or a loved one suffers the unfortunate event of an automobile accident and your children are involved, the Personal Injury Group Attorneys at Morris James LLP will guide you through the process of achieving a settlement that is fair to your children, and will assist you to be certain all applicable statutes regarding minors are complied with. Next Story → Announcing The Morris James Personal Injury Group New Phone App!